Ultra Miami has released archive footage from the first ever edition of the event, which was held back in 1999. It was a year when the Euro arrived as currency, NATO began airstrikes against the Federal Republic of Yugoslavia, 'Star Wars Episode I: The Phantom Menace' hit cinemas, and, Stateside, electronic music remained the freakish pursuit of a rare few heathens, a far cry from the multi-million dollar, headliner-packed industry it has become. Hence the Ultra Beach Music Festival 1999 having plenty of UK on its line-up. Seminal trance imprint Platipus held a showcase featuring Terra Ferma, P.O.B. and Art of Trance. Prog-breaks maestros Hybrid were there, as were the likes of then-BBC Radio 1 resident Seb Fontaine, Graham Gold, Danny Rampling, and liquid d'n'b pioneer LTJ Bukem. The US was still well represented, mind. 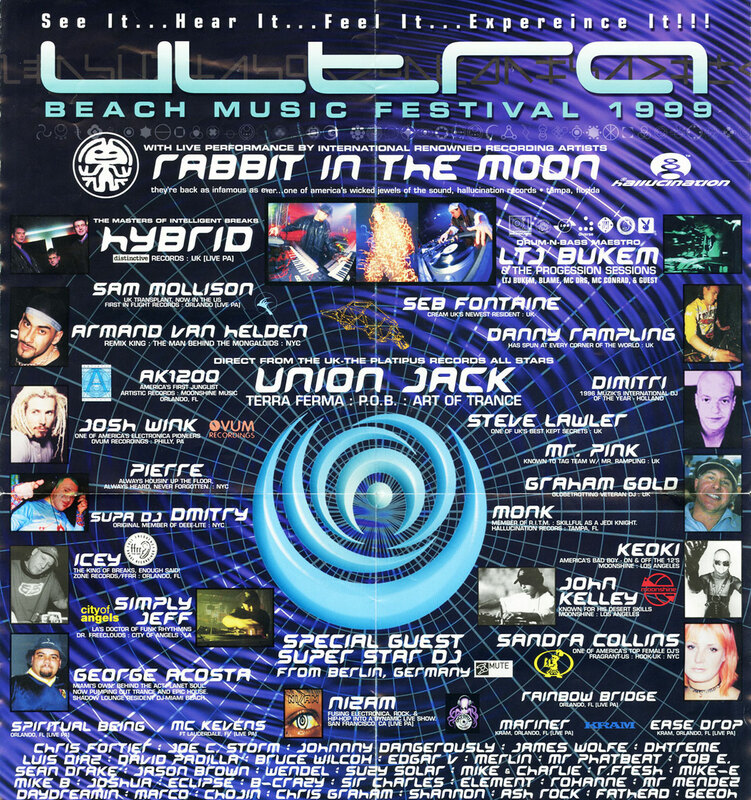 Josh Wink, Rabbit In The Moon, AK1200 (America's first junglist), Sandra Collins, Icey, and Miami's own George Acosta were all on the list. Now, as Ultra Miami preps for its huge "expect the unexpected" 20th anniversary instalment, which takes place from Friday 23rd to Sunday 25th March 2018, the crew have put together a documentary, with the first episode rewinding to that inaugural party, referencing a then-emergent American rave culture, and revealing how significant this session was. In the true spirit of 90s clubbing, then, enough babble, let's get to it. And when you're done below check the full details for this year's Ultra Miami here.